Norfolk now has two Frittons, but this one used to be in Suffolk. Here we are out in the wilds of the Lothingland Peninsula, and in 1974 the border was moved a few miles south so that Great Yarmouth's dreary suburbia could all be taken into Norfolk. Unfortunately for Suffolk, the new border line was taken down to Fritton Lakes, putting this little jewel of a church and its pretty village into the northern county. Perhaps it was compensation of a kind for also having to take on the awful town of Hopton to the east. In this case, Suffolk's loss was very much Norfolk's gain, for this is that rare thing in East Anglia, a Norman church with an apse. They are thin on the ground in the region, and the three best are now all within a few miles on the same side of the border. 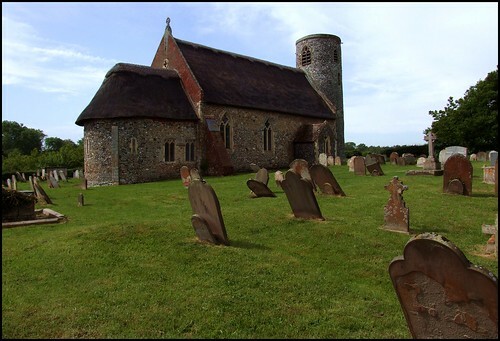 Hales and Heckingham are on the far bank of the Waveney; St Edmund is similarly round-towered and thatched, and if it is not quite as pretty as its two cousins, it is at least as interesting, and perhaps even more of a treasure house than they are. There is a little trapdoor on the south side of the chancel, the purpose of which is not immediately clear. Inevitably in this traditionally lawless area not far from the sea, it has become known as the Smugglers' Loft. The churches of this area are all in the Norwich Diocese, even the Suffolk ones, and while the churches near to Yarmouth and Lowestoft have a reputation for being kept locked, Fritton St Edmund is, thankfully, open everyday, and you step into a pleasantly Victorianised rustic interior. The view to the east is unusual, with the little, low chancel hemmed in up one corner behind a screen which doesn't really seem to fit, and the royal arms high above on top of the eastern wall of the 14th Century rebuilt nave. When the nave was widened, the original north wall was retained and the other wall rebuilt about three metres further south, thus the curious juxtaposition between nave and chancel. In the splay of a window on this south side the rebuilders painted an image of a Saint, possibly St John the Baptist holding an agnus dei, while on the north wall opposite the south doorway is a massive St Christopher of about the same date. Otherwise, the nave is rather austere, the recut square font at the west end lending a note of gravitas. This plainness and simplicity offset the fabulous jewel-like interior of the chancel, which you step down into as if into a quite different church. It is a remarkable survival. The tunnel-vaulting is an extraordinary thing to find. The trapdoor outside lets into the space above it, but more interestingly vaulting of this kind is often associated with there having been a tower above. Not only the vaulting of the apse has survived, but in 1967 a sequence of wall-paintings depicting the martyrdom of St Edmund were uncovered in the eastern end of the apse. It is one of the most complete sequences of the subject in England. The Saint himself appears crowned and shot through with arrows in the central panel, and other panels depict Danish bowmen, possibly St Peter and a donor. There is a little panel of Victorian glass depicting St Edmund at the centre, a happy accident because they could not have known about the wall paintings. The chancel windows are furnished with some excellent early 20th century glass depicting a sequence of East Anglian Saints. They include St Walstan, St Olaf, St William of Norwich, St Felix, Fursey, St Wendreda, St Etheldreda and the more international seafaring Saint, St Nicholas. It is a perfect setting for them. The screen has obviously been restored, perhaps more than once, but it almost certainly dates from the time that the nave was widened. There is said to be another which is almost identical, only better, in the now-closed church at Belton a few miles off, where it awaits an uncertain fate. No such fears here; I compared St Edmund with the churches of Hales and Heckingham near the start of this piece, but it is worth adding that this is the only one of those three apsed Norman churches which has not been declared redundant, and is still home to an Anglican faith community. Arthur Mee, in his 1940s Kings England: Suffolk, waxes so lyrically about Fritton that you might be forgiven for thinking that he is actually writing a spoof, or a parody of himself. Here is heart's delight, he begins, for painter, poet and naturalist; great waters, spreading woodland, nursery of multitudes of water-fowl, and nightingales which sing in chorus the livelong day and night of their minstrel season. Mee also recalls the inconsequential but fascinating detail from the registers that on the 17th day of August 1816, Hannah Freeman did penance in the church for defaming the character of Mary Hanham, spinster. There is a good story behind that, no doubt. Today, most visitors to this parish are here on holiday, because around the great Fritton Lake, which is the longest in East Anglia, spreads Fritton Country Park and its associated camping sites. Part of the lake is Fritton Decoy, a long, narrow stretch into which ducks were attracted to be shot in their hundreds by 19th century worthies. There is something pleasingly old-fashioned about the setting, as if the Famous Five might even now be in a tent nearby, awaiting an adventure.